I’d like to take a second to tell everyone about the new forums that I’ve just opened! I decided that this would be a much better outlet for discussion than a Facebook group because of the organization quality of information, and the more communal feel. If you’d like to take the time to join us, partake in discussions about everything keto, and voice your successes – feel free to join us on the Ruled.me Forums! Anyway, back to the food. These little morsels are just divine. 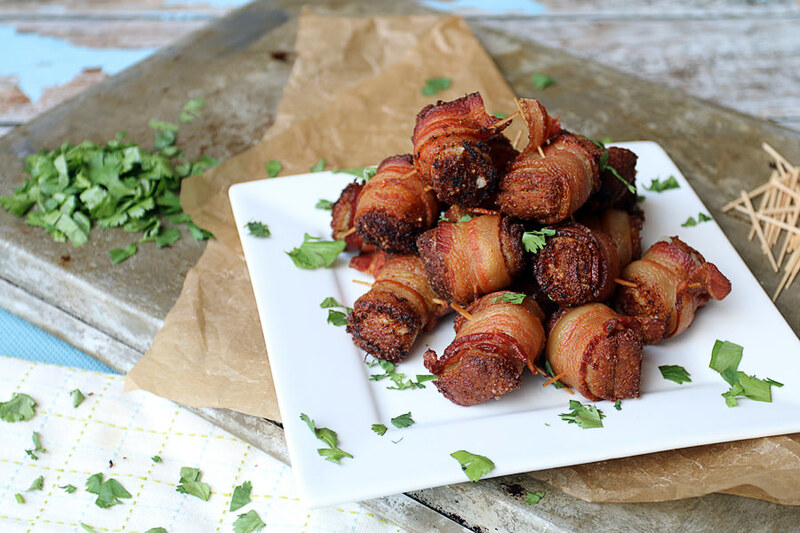 It’s like biting into bacon wrapped cheesy bread that’s soft and gooey in the middle and nice and crunchy on the outside. I literally ate 17 of these in the same day because they were just that good – I couldn’t stop with just 1. I highly recommend these for special occasions – where you might be serving appetizers or need snacks available to people. 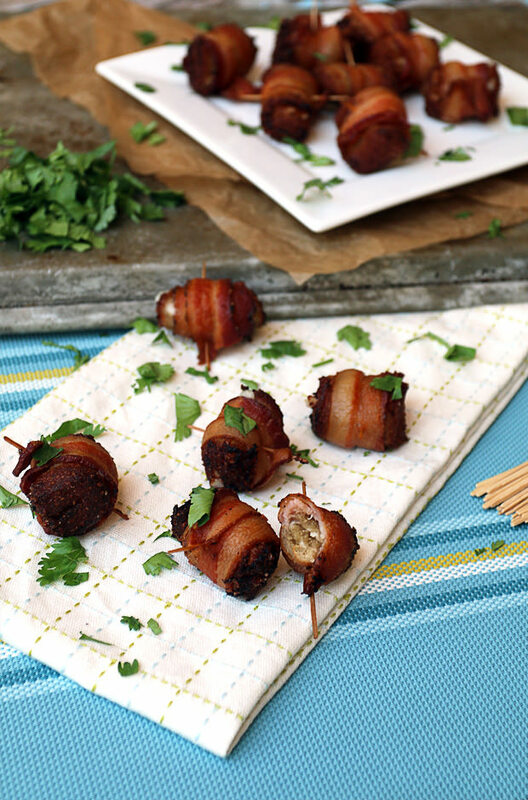 They’re very easy to make, but it is a little time consuming (wrapping anything in bacon requires the utmost care of course, which also means time invested). But, in the end, they’re well worth taking your time over because they’re just fantastic. All of the spices come through subtlety in the dough of the “bread”. The delicious taste of the bacon paired with the tallow I fried them in is delicious. The cheese oozes out as you bite into them when they’re still warm, and the crunch to finish it off is the perfect ending to an all-encompassing bite. 1. Add 4 oz. (half) Mozzarella cheese to a bowl. 2. Microwave 4 tbsp. butter for 15-20 seconds or until it is melted completely. 3. 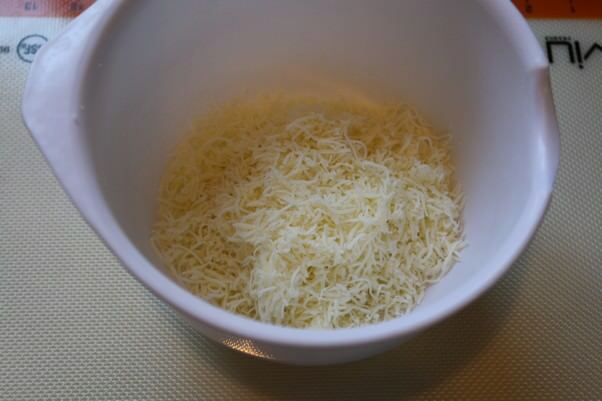 Microwave cheese for 45-60 seconds until melted and gooey (should be a bit more melted than shown in picture). 4. 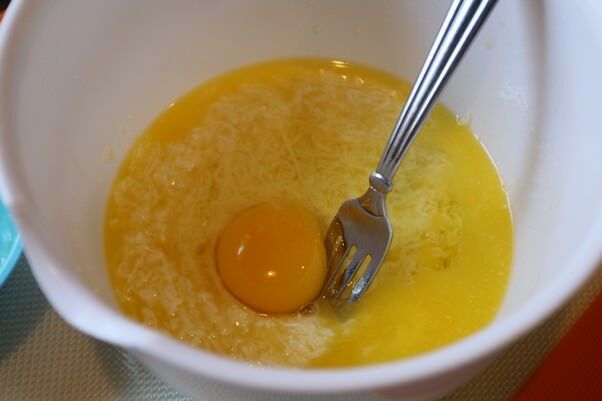 Add 1 egg and butter to the mixture and mix well. 5. Add 4 tbsp. almond flour, 3 tbsp. psyllium husk, and the rest of your spices to the mixture (1/4 tsp. Salt, 1/4 tsp. Fresh Ground Black pepper, 1/8 tsp. Garlic Powder, and 1/8 tsp. Onion Powder). 6. Mix everything together and dump it out onto a silpat. 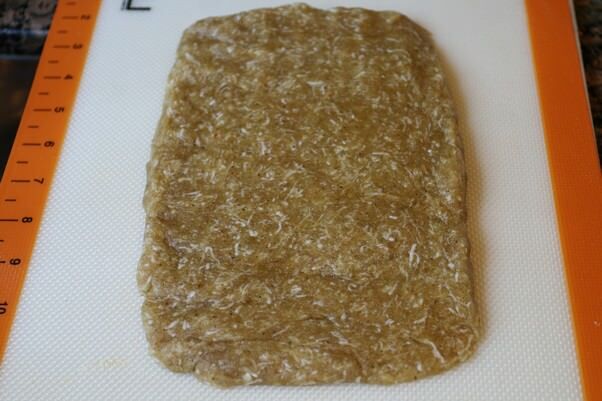 Roll the dough out, or using your hands, form dough into a rectangle. 7. 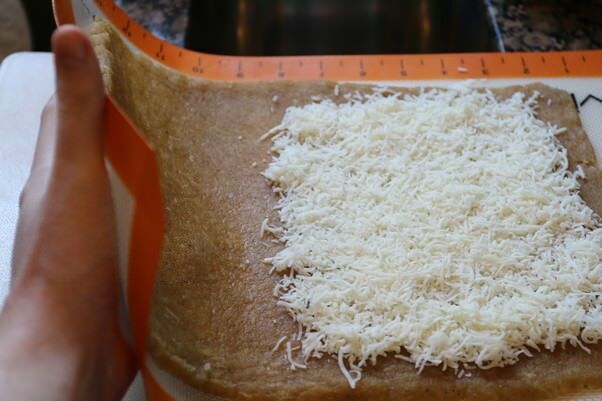 Spread the rest of the cheese over half of the dough and fold the dough over lengthwise. 8. 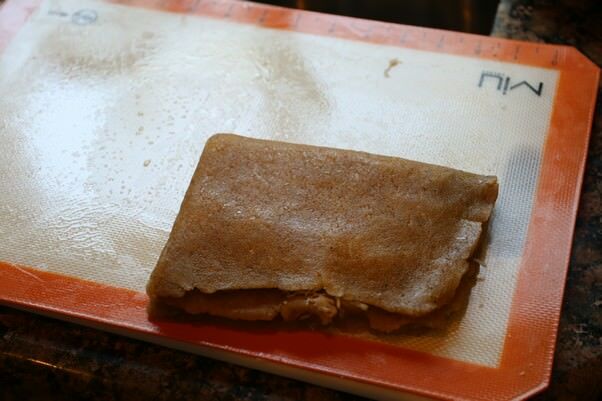 Fold the dough again vertically so you form a square shape. 9. Crimp the edges using your fingers and press the dough together into a rectangle. You want the filling to be tight inside. 10. 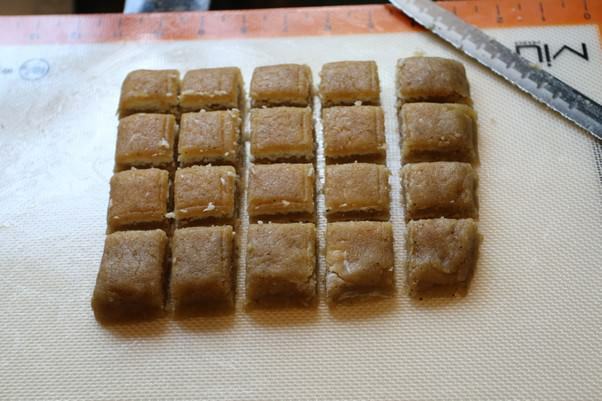 Using a knife, cut the dough into 20 squares. 11. 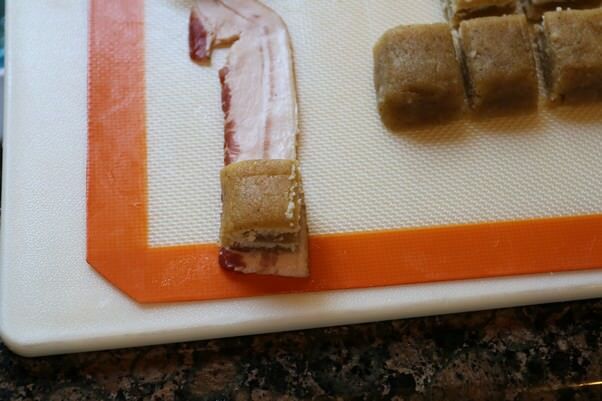 Cut each slice of bacon in half, then lay the square at the end of 1 piece of bacon. 12. 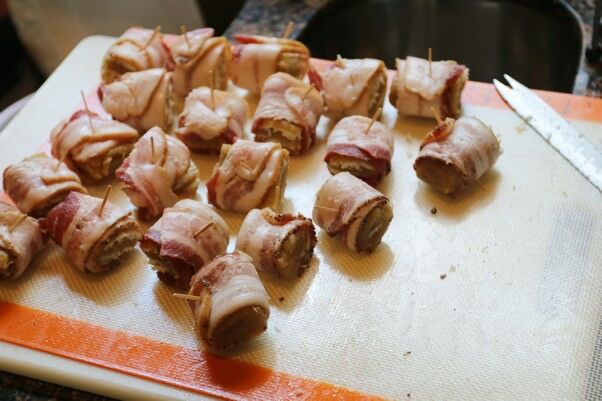 Roll the dough into the bacon tightly until the ends are overlapping. 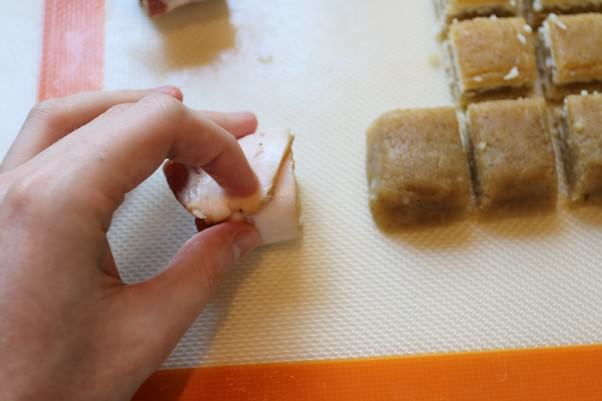 You can “stretch” your bacon if you need to before rolling. 13. 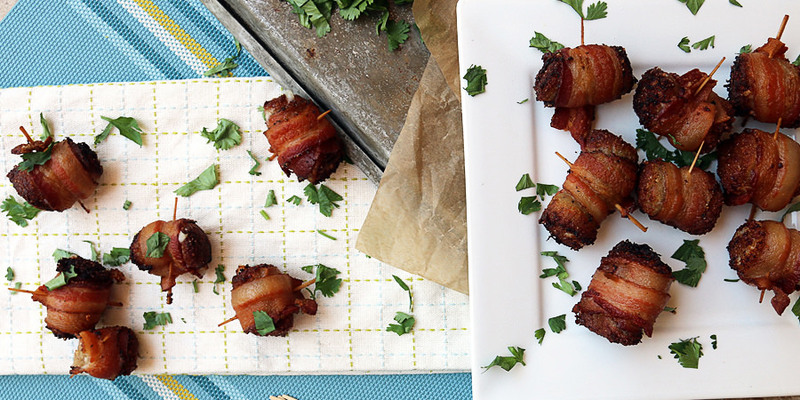 Use a toothpick to secure the bacon after you roll it. 14. Do this for every piece of dough that you have. At the end you will have 20 cheesy bacon bombs. 15. 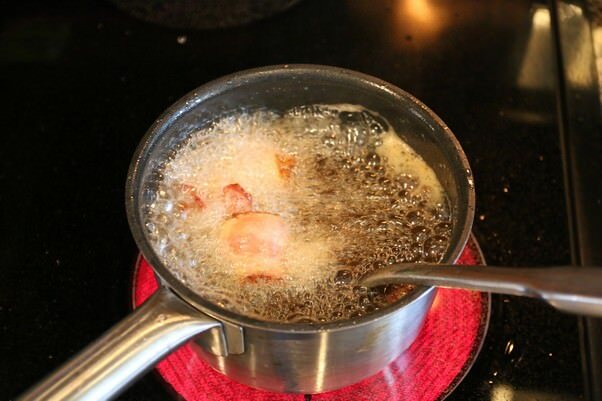 Heat up oil, lard, or tallow to 350-375F and then fry the cheesy bacon bombs 3 or 4 pieces at a time. 16. Remove to a paper towel to drain and cool once finished. This makes a total of 20 Cheesy Bacon Bombs. Each comes out to be 92.8 Calories, 7.53g Fats, 0.66g Net Carbs, and 4.61g Protein. 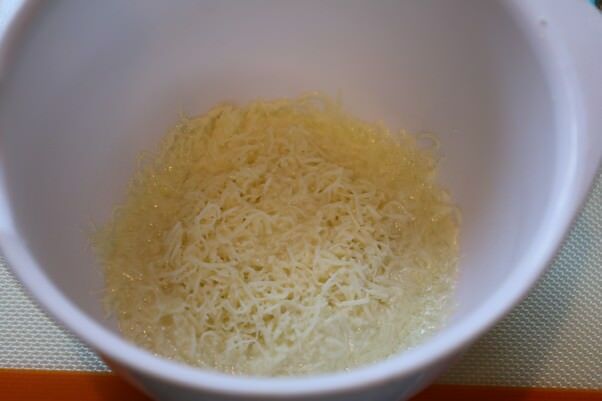 Microwave half of the cheese for 45-60 seconds or until it is melted and gooey. 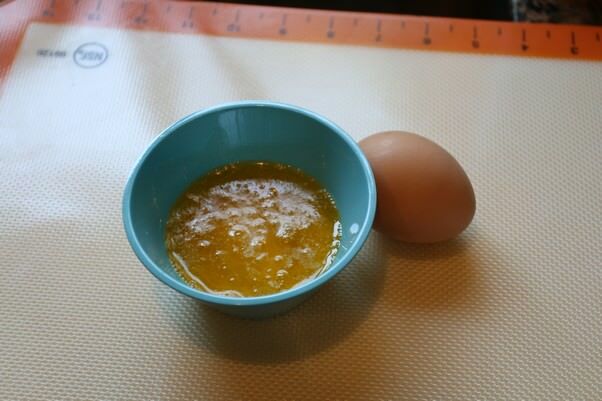 Microwave butter for 15-20 seconds until fully melted, then pour butter into cheese and egg egg. 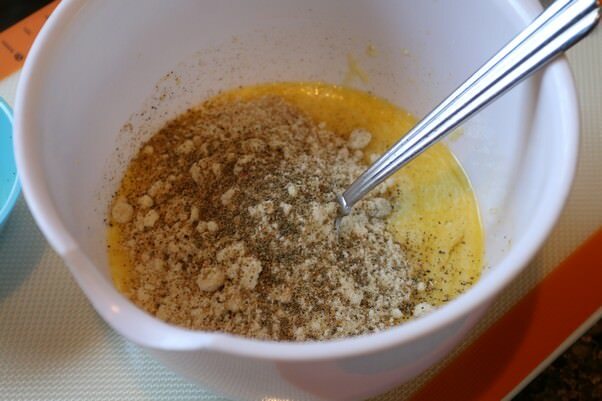 Mix together and add psyllium husk, almond flour and spices. Mix together again and pour dough out onto a silpat. 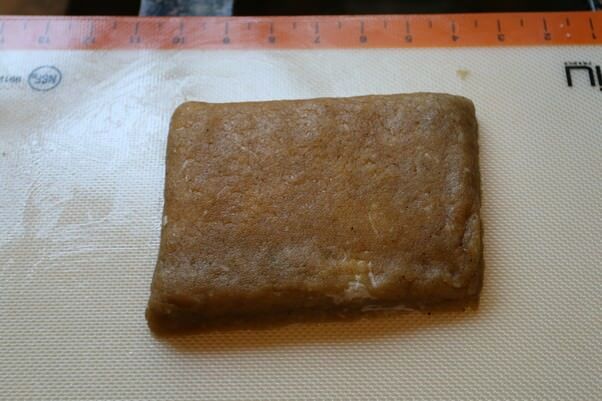 Pretty dough and roll out into a rectangle. Fill rectangle with rest of cheese and fold in half (horizontally), then in half again (vertically). Crimp edges and re-form into a rectangle. Cut out 20 square from this. 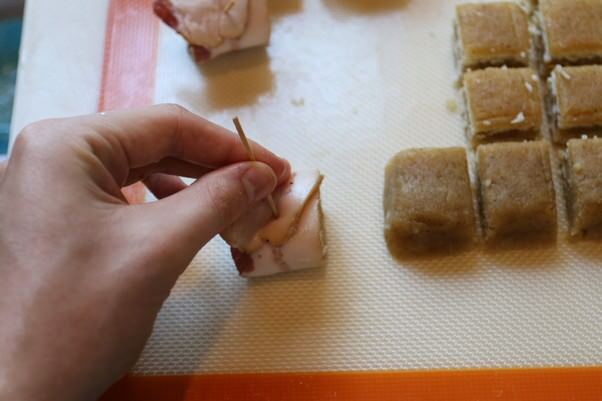 Wrap each piece of dough in half of a piece of bacon tightly, using toothpicks to secure the bacon. 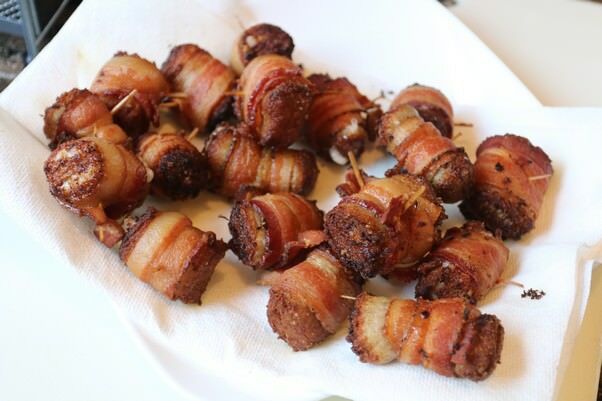 Heat out to 350-375 degrees, then fry each cheesy bacon bomb for 1-3 minutes each. Remove from oil and let cool on paper towels, then serve!